08 | December | 2011 | Beyond The Yew : Saying NO to Zionism! BBC News – How Scandinavian is Scotland? They don’t make bridies in Bergen or Tunnock’s Tea Cakes in Torsby. 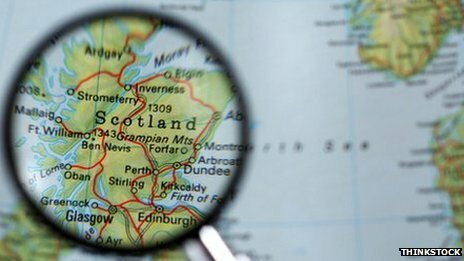 According to reports, strategists within the Scottish National Party (SNP) government have drawn up plans to shift the country’s focus away from the UK and towards the Nordic countries if a referendum on independence is passed. It’s a plan which might appeal to those who support the SNP’s drive for a sovereign Scotland, and might be expected to attract opposition from supporters of the union. But regardless of contemporary politics, looking north reveals much about a little-discussed aspect of how the national character was forged. The union with the rest of the UK may be more widely discussed in a political context, and Scotland’s Gaelic and Celtic heritage might be widely celebrated. But the long history of Viking and Norse settlement in Scotland has left an indelible mark. 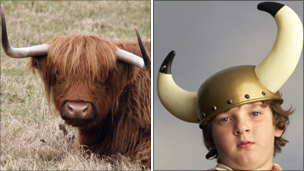 Scots words like bairn (child), midden (dump), muckle (large) and even kilt (from the verb kjalta, meaning “to fold”) are derived from Old Norse. Places like Dingwall, Wick, Lerwick and Tinwald can all trace their etymology back to the same source. 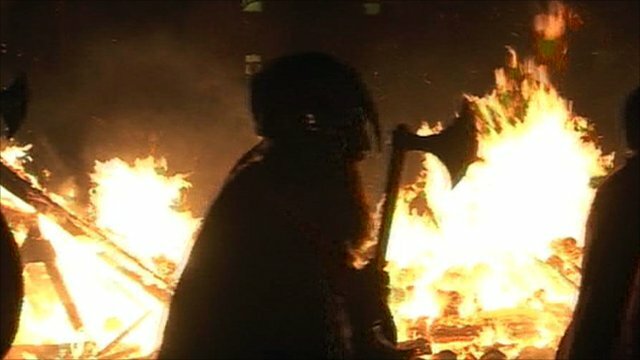 This heritage is most visible during the Up Helly Aa fire festivals in Shetland, which culminate in the burning of a replica Viking galley. But the cultural analogies persist in modern times, and not just in terms of Scottish shoppers visiting chains like H&M or Ikea. Recent years have seen an upsurge in international interest in gloomy, gritty, Scandinavian crime fiction such as the Wallander series, Stieg Larsson’s Millennium trilogy or the Danish TV series The Killing. Their success mirrors that of so-called “Tartan noir” writers like Ian Rankin, Val McDermid, Christopher Brookmyre and William McIlvanney, who have also used the detective genre to explore social themes. According to Rankin, these very similar strands of fiction hint at something deep-rooted in national characteristics. “In countries where it’s dark half the year, you do tend to have a great tradition of storytelling,” he says. “Whenever I’ve met Scandinavian writers, we do share quite a dark sense of humour and a feeling that the world’s messed up, we might as well laugh about it. A shared Calvinist tradition may account for this common interest in a genre which thrives on a pessimistic view of human nature. But as Rankin suggests, many of the cultural similarities could owe much to proximity. An oft-repeated tale has Jo Grimond, former Liberal MP for Orkney and Shetland, being asked to give the name of his nearest rail station on a parliamentary expenses form, and writing “Bergen, Norway”. And for centuries there were political links across the North Sea. The first Viking raid on Iona is thought to have taken part in 794, and much of the Hebrides and Caithness would come under Norse rule. Orkney and Shetland continued to be earldoms under Norway until 1468. This settlement resulted in the Scandinavian-derived Norn language being spoken on Orkney and Shetland until the 18th Century, and influencing the Shetlandic and Orcadian dialects to this day. But this Norse settlement did not, in the main, affect the central belt – the most populous, culturally dominant part of the country. This has meant the Nordic influence has been downplayed, according to Norwegian-born Dr Arne Kruse, senior lecturer in Scandinavian studies at the University of Edinburgh, who has lived in Scotland for 22 years. In his view, however, this has led to many important potential areas of co-operation being downplayed. In particular, he says, Scotland’s Presbyterian heritage mirrors Scandinavia’s Lutheran tradition, lending both peoples an egalitarian suspicion of rank and a strong emphasis on the importance of education. But while in recent decades, Scotland’s preferences as expressed at the ballot box have arguably been closer to those of social-democratic Scandinavia than much of the UK, the economies of both sides are very different. The Nordic countries have thrived on high-tech, high-skilled industries. By contrast, Scotland has placed far greater emphasis on services since its decline in heavy manufacturing. The Scotsman columnist Lesley Riddoch set up the think tank Nordic Horizons to push for closer links between the Holyrood parliament and its northern neighbours. She argues that regardless of whether Scotland opts for independence, it should seek to learn from these countries. “It’s like two cousins who have gone their own ways – only one of them still has his own hair, but they’re still cousins,” she says. However, Riddoch accepts that the north will only ever be one influence on Scotland. Unsurprisingly, many Scots strongly identify with their Gaelic heritage. Estimates suggest that a third of Glasgow’s population has family ties with Ireland. Additionally, the fact that most opinion polls still show only a minority of Scottish voters favour independence is used by supporters of the union to argue that voters still value the link with the rest of the UK. Indeed, Kruse argues that this mix of cultural influences is what sets the country apart from the more homogenous Nordic nations and, ultimately, makes Scotland Scottish. Comments Off on How Scandinavian is Scotland? Prime Minister Vladimir V. Putin on Thursday accused Secretary of State Hillary Rodham Clinton of instigating protests over the results of Russia’s parliamentary elections by baselessly criticizing the vote as “dishonest and unfair” and he warned that Russia needed to protect against “interference” by foreign governments in its internal affairs. Mr. Putin’s remarks signaled a new worsening in relations with the United States, threatening the Obama administration’s efforts to “reset” the relationship with Russia. His critique was strikingly personal. By singling out Mrs. Clinton, rather than making a vague comment about the West, he effectively thrust the United States on the side of the protesters in the streets challenging the Kremlin’s authority, and not entirely without reason. Mrs. Clinton has been outspoken in her criticism of the election, issuing several strongly worded statements, beginning on Monday, after a preliminary report was released by observers from the Organization for Security and Cooperation in Europe. “The Russian people, like people everywhere, deserve the right to have their voices heard and their votes counted,” Mrs. Clinton said on Monday in Bonn, Germany, while attending a conference on Afghanistan that included Russia’s foreign minister, Sergey V. Lavrov. “That means they deserve a free, fair, transparent election and leaders who are accountable to them,” she said. The observers issued a scathing assessment in which they said their main concerns were deep structural problems, including the absence of separation between the government and United Russia, Mr. Putin’s party. Mr. Putin’s assertions of foreign meddling and his vow to protect Russian “sovereignty” came after three days in which the Russian government has moved forcefully to tamp down efforts to protest Sunday’s elections. The authorities arrested hundreds of demonstrators and deployed legions of pro-Kremlin young people in Moscow to occupy public squares and to chant, beat drums and drown out the opposition. Another major opposition demonstration is being planned for Saturday in central Moscow, and while Mr. Putin said that lawful rallies should be permitted, his warnings about foreign interference suggested that the government would view the continuing protests over the elections as a threat and would take further steps to contain them. “We have to protect our sovereignty, and it is necessary to think about improving the law and toughening responsibility for those who take orders from foreign states to influence internal political processes,” Mr. Putin said. Large contingents of riot police remained in Moscow, as part of what officials have described as a period of heightened security around the elections. The governing party, United Russia, which has nominated Mr. Putin for president, lost a surprising number of seats in Sunday’s elections. But opposition parties say those losses would have been even steeper were it not for the violations cited by election observers, including the brazen stuffing of ballot boxes at some polling stations. And there were some predictions on Thursday that outrage over the election results would continue to grow. Mr. Markov said he expected the government to treat the public like a whining child. “The authorities will attempt to conduct themselves with society as a parent would a child who is crying and demanding some kind of toy,” he said. “In this case, it is not correct to go out and buy the child a toy, but rather distract him with something else. Government officials had previously accused Golos, the only independent election monitoring group in Russia, of being financed partly by the United States and other Western countries and of aiding foreign nations in meddling in Russia’s affairs. At NATO headquarters in Brussels, Russia’s ambassador to the alliance, Dmitri O. Rogozin, echoed Mr. Putin’s remarks, saying the election was an internal matter for Russia and should not be subjected to criticism from Mrs. Clinton or others. The election loomed over Thursday’s meeting between Russia and the alliance, already strained by disputes over missile defense and NATO’s operations in Libya and Afghanistan. Mr. Rogozin said that NATO’s leaders pledged to cooperate with Russia on military issues, while ignoring its basic concerns about an exit strategy in Afghanistan and the architecture of the missile defense system. “We want our position to be understood,” he said. Tensions with NATO have been rising as Russia intensifies its complaints about the American missile defense system being deployed in Europe. American and NATO officials have sought to reassure Russia that the system is designed to counter threats from Iran, but the Russians say those assurances are not sufficient. Mr. Lavrov reiterated Russia’s concerns in Brussels on Thursday. President Dmitri A. Medvedev has warned that Russia would respond to the deployment of the system — which is scheduled to be operational by next summer — with its own military deployments and that the dispute might even lead Russia to withdraw from the New Start arms control treaty. A senior administration official traveling with Mrs. Clinton during her meetings at NATO said that the alliance would move ahead with the deployment regardless of Russia’s objections. The official said NATO officials considered Mr. Medvedev’s remarks to be largely rhetorical. “This is something that was taking place within the context of the Russian elections,” the official said. The political context will only get more complicated as Russia and the United States each look ahead to presidential elections in 2012. Mr. Putin on Wednesday formally filed his registration papers as a candidate for president in elections to be held in March. In September, he announced his plans to return to the presidency — he served two terms as president before becoming prime minister. The announcement that he would swap places with Mr. Medvedev seemed intended to help build support for United Russia in the parliamentary elections, but it seemed to have the opposite effect. The party, which had already been experiencing a decline in popularity, slipped further in the polls. In Sunday’s elections, United Russia finished as the leading party, but with slightly less than 50 percent of the vote. In the new Parliament, it will control 238 seats, down from the 315 seats it now holds. The Communist Party finished second in the balloting, followed by Just Russia, a social democratic party, and the nationalist Liberal Democratic Party. Speaking at the Presidential Candidates Forum hosted by the Republican Jewish Coalition in Washington, the former Massachusetts governor was introduced as “the next President of the U.S.” – to applause. Republicans have complained that the Obama administration has favored the Palestinians over traditional U.S. ally Israel in the long-running Middle East dispute. Obama angered the Israelis last May when he embraced a goal long sought by the Palestinians: that the state they seek in the occupied West Bank and Gaza Strip should largely be drawn along lines that existed before the 1967 war in which Israel captured those territories and East Jerusalem. The Republican Jewish conference is to hear from all the major Republican candidates seeking the 2012 nomination, including surging Romney rival Newt Gingrich. Perry raised eyebrows at a debate last month when he called for zeroing out foreign aid and then restoring it on a case-by-case basis. 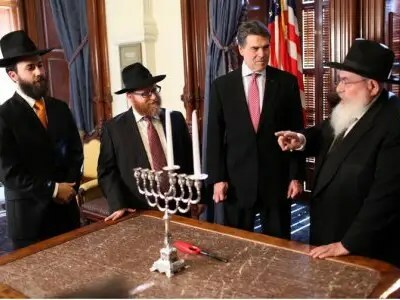 “And yet President Obama systematically undermines that relationship with Israel,” said Perry. “Israel will face terrible reprisals from Iran … so the military option is not one Israel will take easily or lightly,” he added, stressing that the U.S. should offer guarantee supply chain and “vocal, unerring moral support” in the face of international commendation. American foreign policy to the country has become “an incoherent mess,” he said. “They’ve emboldened our adversaries by isolating our allies,” he said.